Have you ever dated someone that you thought was right for you, but it turned out all wrong? Most women have a distorted vision of what they need in a relationship that will be truly happy and fulfilling. Their dream guy isn’t right for them at all! I know, I married my dream guy and it was a disaster! And the best way to make the right decision is to Know Yourself! First, and by far the most important, know your own values so you’ll know if you and your prospective mate share a similar value system. Your relationship won’t last if your values are too dissimilar, or if you blindly follow the values of your parents or your friends. To discover YOUR values ask yourself, “What’s really important to me? Second, know what really interests you. What naturally gets you excited and captures your attention? Whatever brings a joy and vitality to your life makes you more attractive! And when you’re participating in what interests you, you attract others who like the same things. Third, know your habits and preferences. The older you are, the more ingrained those habits and preferences can become, like your sleep cycle, need for alone time, personal space, routines, room temperature, light, organization, neatness, cleanliness, meal times, food preparation, financial systems, clothes, decorating, TV, music, etc..
It’s important to be yourself and to have your own standards, but the more rigid you are the less attractive you are. Be careful about your habits and preferences becoming “must haves” and non-negotiables..
Fourth, know your physical and emotional Nature. Being healthy physically and emotionally is a key factor in having a healthy relationship. It also contributes to how attractive you are, regardless of your physical beauty! 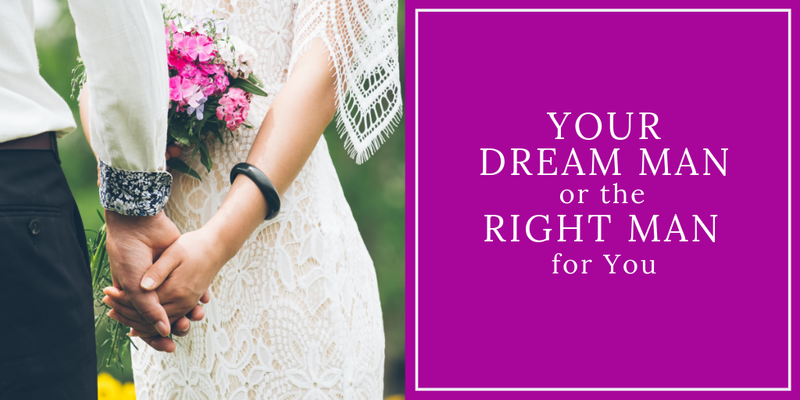 Here are some key questions to help you recognize some trouble spots that may be getting in your way of attracting and keeping the Right Man for YOU! Are you proactive or reactive with your health? Do you eat healthy food, exercise, keep yourself well groomed and seek out opportunities for personal development or are you unconscious about what you eat, live a sedentary life, pay little attention to your grooming and wait for a crisis to force you to grow? Do you recharge your emotional batteries by taking time for self-reflection and rest? Or do you go like the Energizer Bunny until you get sick or have a melt down? Do you feel secure about yourself or are you defensive, getting your feelings hurt easily? Do you consider the other person’s point of view before responding or have a quick temper, reacting before you think? If you blindly go into a relationship without knowing yourself you won’t be able to identify the potential trouble spots and deal with them before they blow up the relationship. Rather than invite heartbreak and disaster, know yourself so when you’re with a prospective mate you can see whether you have met a potential keeper! (of course there are other consideration before you know, but these items will make or break a potential relationship. Click here to have a Love Breakthrough Session with me. Create clarity about the relationship you really want to have this year! Find out the essential building blocks for attracting the love of your life! Click here to have a one hour private Love Breakthrough Session with me. I look forward to helping you have the love you’ve always longed for.